You can select to filter your result on a specific period of time or interval of time directly in your report. For example, if you have an ongoing NPS survey that is sent on a regular basis, and will remain active under a longer period of time, you can filter your report to only display the results that have been registered in the last 30 days. This can be very useful to display relevant survey responses and keep track of the progression of your survey results. How do I filter my result based on time? Each of these options will customize your report to only display the answers that were registered during the selected period of time. 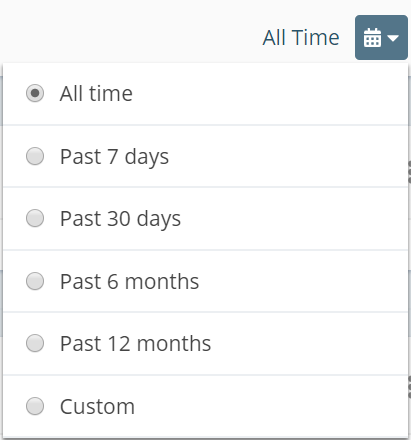 If you select “Custom”, you will need to select dates to set your desired time period. You can apply the same filter by clicking Filters in the left-hand menu and select Report period under General filters. Under Filters on series you can change the time period for already existing series in your report. Go to Series and press Add series to create an additional data series to your report. With this option you can have multiple series, displaying different periods of time in the same report. For example, you can have one series displaying the result for the last 12 months, a second one for the last 6 months and a third for the past 30 days to give you a quick overview of the progression over time of your results.